How do I talk about 11? Every day is different. 11 is trying on different things to see if they fit you. Including things like sarcasm and insults, only lacking the skill to make it lighthearted and without a sting, as some of those you try to emulate are able to do. One day you try on sullenness, "Do I have to?" You torture me with the slowest. possible. way. to do everything. Other days you try being a smartass, or a know it all, or experiment with telling me how things ought to be done. Things I've been managing quite well since before you learned to wipe your own bottom, I might add. You are learning your power, how much of it you have, and what to do with it right now, and it is with fear and trembling that I shoulder the task of trying to guide you through it. Well, that and a great deal of impatience because, seriously? What were you thinking? We're having a baby in Thailand! I thought I had better tell you since I'm blaming early pregnancy for my erratic posting schedule, and the way I keep falling asleep when I'm trying to do things. 1. I'm due at the end of May. 2. Yes, we still plan to go to Thailand. The kids and I will go earlier than Aaron, so as to not be traveling/moving during 3rd trimester. You all know I make a lot of capes for my kids to dress up in. With the Boy's Hobbit themed birthday part coming up this Saturday I'm about to enter full costume mode again. Which caused me to remember that I keep saying I will some day post a cape making tutorial. Well, that day has come. Just in time for all you last minute costume makers out there. However, since I am not actually sewing a cape right now you get my awesome hand drawn illustrations, which I hope are clear. Start with a long straight piece of fabric, usually about 45 inches wide. If when you buy it there aren't any words printed on the side and they are finished that will save you a step and you won't have to hem the sides. Hold it up to your child and decide how long you want it to be. Grab it right at the place where the neck will be and then measure about another foot along to use for the hood. You will lose about 4 inches when you do the tie at the neck so factor that in before you cut. If there's one thing I've learned over the years it's that strong isn't something you feel, strong is what you do. I've had people accuse me of being strong all my life (when they are being kind, there have been worse things said), and I've often been offended by it because I don't feel strong, and I'm sure they are wrong, and also, I'm confused by the unexpected reactions when I sometimes just stand firm about something I care about and accidentally cause people to be affronted. I think that persistence is mistaken for strength sometimes. When Aaron and I were engaged he once said something to me along the lines of, "I can't stand being around weak clingy women, it drives me nuts. So it's good that you are a strong women." It's one thing to spend a year talking about and preparing for a giant step, like picking up your whole family and moving to Thailand to see through the self sustaining orphan care model that you are designing. It's another thing to announce the same thing to the world at large. There's something about taking the word "maybe" out of the sentence, "We're going to Thailand next spring." that makes the whole thing finally settle in that place in my brain that wonders why I'm dreaming up an art project for the wall near the front door and saving that fabric for curtains when we're leaving in 6 months. Six months! That's coming up fast! I need to deep clean the oven so it's easier on move out day. We are your love extended. Our family may be the ones packing our bags and getting on a plane, but we know for certain that we can't go, unless you come with us. You are such a vital part of this adventure that without you it doesn't happen. We don't think of this as something that just we are doing. This is something we all get to do. We ask here for the privilege of being your care, love, and drive to see the world made better extended to where the world needs it most. When the 30 children we are caring for right now grow up and become the business leaders of their communities, bringing change and life, you get to say, "I made that happen! That community is different because I made a choice to do something about it." When the new childcare community in Mae Sot is up and running, and women are empowered to provide for their families, extended to include the children who have no families, I want you to tell your friends that you created a childcare community in Mae Sot. I've been imagining the letter I want to write at the end of next year to everyone who has been giving regular monthly support to Baan Saeng Saiwan, the orphanage that we started with in 2008..
Thank-you for your faithful support of this orphanage over the past several years. These kids couldn't have made it without you. I am very pleased to inform you that this home is now completely self sufficient financially and no longer requires outside support. Please feel free to redirect your support to another home. Wouldn't that be the most awesome letter ever in the history of non-profits? I think so. I'm hoping you will help us to make it a reality. Some of you came here because a friend told you you should and you are wondering to yourself, "Why on earth should I give my hard earned cash to support a family living in Thailand for a year or two? What does that accomplish?" 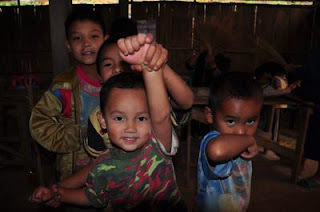 Long time readers might remember 4 or 5 years ago when I told you all that we had been asked to help an orphanage and refugee community in northern Thailand and that we were planning to move there in order to do so. -Incorporated as a 501c3 non-profit called The Charis Project with a board of directors and everything that goes along with that. -Got a truck so the kids could get safely to school that they then began using to bring the home income by using it for a transport business as a school bus and for farmers going to market.